A new website called LegalOptics is using an algorithm to analyze driving-under-the-influence cases in Florida and identify the attorneys who get the best results for each judge and case type. The purpose of the site is to help consumers find the right attorney by providing a more-granular analysis of their records than simple win-loss rates. The system scores attorneys based on both attorney actions and case outcomes before particular judges. Attorneys who score at least 10 percent more than the average score for a particular judge are given an “A” grade and only they are listed on the site. LegalOptics so far covers only cases in Florida’s Hillsborough County. Harden says he will soon add Pinellas County and is working on adding others. Our system identifies the attorney on each case, and then assigns each case a grade, based on a scale of 5 (worst) to 10 (best). The system averages those scores and compares each attorney’s average score to the average of all private attorneys for each judge. Grades are assigned based on how much higher or lower each attorney’s scores are compared to the average of all private attorneys. Grade ‘A’ attorneys scored at least 10% or higher than the average private attorney score for that judge. In addition, the system compiles information on outcomes by judges. 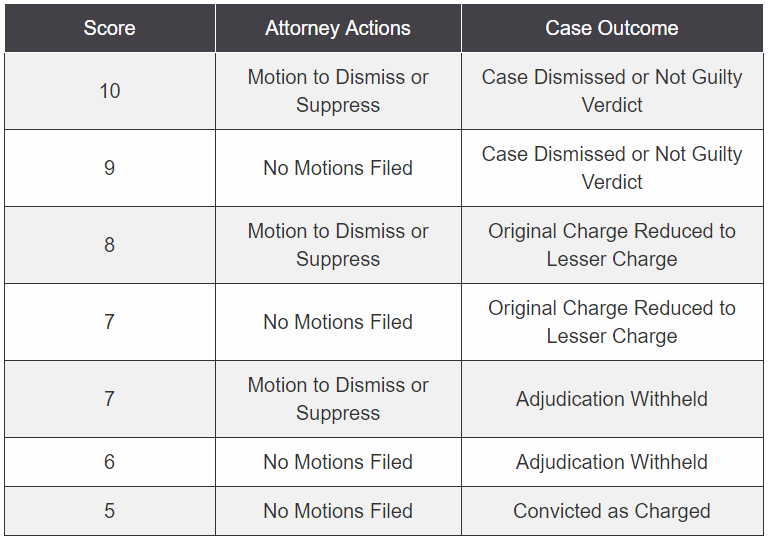 It shows the top-performing attorneys for a given judge and also shows data on outcomes for that judge. For example, for Hillsborough County Judge John N. Conrad, 42 percent of people accused of DUI are convicted, 44 percent have their case reduced to the lesser charge of reckless driving, and 12 percent have their case dismissed. Those who are represented by an A-rated attorney in Judge Conrad’s courtroom avoid conviction 85 percent of the time, according to the site’s data. We’re an attorney advertising resource, we’re not shy about saying that. But let’s be clear about one thing: attorneys do not pay to be graded by our algorithm. They also can’t pay us to receive a better average grade. Attorneys pay to claim their profile page and to get access to our court data through a data portal. Attorneys who subscribe to the site get access to a dashboard that provides deeper analysis of case statistics and data for three Florida counties: Hillsborough, Pinellas and Pasco. Also, for attorneys who do direct advertising, the dashboard lists recent case filings for a variety of criminal and domestic case types. A planned enhancement to the dashboard will allow attorneys to search for cases by law enforcement officer.